Thirty-One: Great Bags, Totes & More with a $25 GC Giveaway Coming Soon! Most girls (women) love pretty things and most of us like a special touch added to be part of us. I know when I want certain things, having it look just as I want it means something to me. 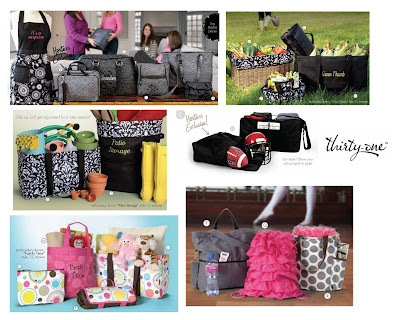 I also like products to be functional and fashionable which is where Thirty-One comes in. Thirty-One is named after the versus of Proverbs 31 by the amazing woman who took a chance eight year's ago and started her own business. Now, we can all enjoy some terrific looking items that not only will look great but will serve as very functional. When I first looked through the catalog, I couldn't decide what I wanted as there were so many things I would LOVE to have. Whether it's every day life, special occasions or running errands, there is definitely something for every one as well as every lifestyle. With fall quickly upon us, the seasons provide different needs for us such as the holidays, football and more. I gathered together some of my favorites below. Items marked with an E, E2 or E3 can be personalized for a small fee. There is even a guide in helping you choose the thread color to ensure you get it right the first time. There are endless possibilities and whether or not you are celebrating yourself as who doesn't want to buy themselves something or if you want to get a jump start on Christmas, check out Thirty-One and get ready for a $25 gift certificate giveaway coming soon!